With help of this form Site Administrator can create and change Registration forms for his/her students. Administrator can set up here important fields, some of them can be obligatory, and some optional. There are 2 sections at this page, the section to the left includes fields that will be in Sign Up Form. The sections to the right are additional ones you can move to the left, thus they will be displayed in Sign Up Form as well. You can move these sections with one mouse click. 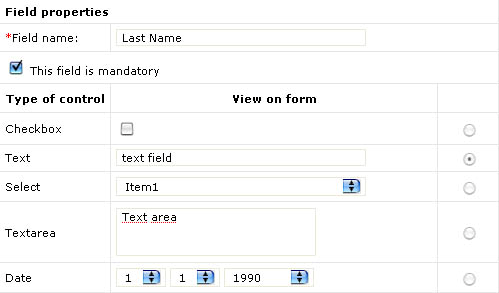 Fields names, type of control can be managed here, you can also set up, if the field is mandatory or not. All form components can be edited and deleted, First and Last Names cannot be deleted as this information is important. Below is the type of control management that can be edited in “Form components”. Date – choosing a date from data source. Associated pattern – a rule that can be chosen for this field from “Manage patterns” section. It means verification, if there are no prohibited symbols and scripts. This section allows Administrator to set verification of symbols that can be added to the registration form fields. Administrator can use regular expressions to allow / prohibit some symbols and also set them as mandatory. Most common fields for checking are Name, Email, Login and Password. You can use existing rules and add new ones.